The Pre-K class expands on our Twos-Threes Class to include more pre-math and early literacy skills; the various curricula that emerge from the children's interests are infused with the foundational concepts that children need to be exposed to before entering Kindergarten. The teachers begin the school year by carefully arranging the classroom with various areas of interest: dramatic play, a reading corner, a sensory table, a block building area, a drawing and writing center, and a clay table. For the first four to six weeks of school, while the children explore the classroom, the teachers are focused on getting to know the children, helping them get to know each other, and documenting their interests. We look for recurring themes in their play, and interesting questions and ideas that arise. Teachers meet weekly and discuss their documentation of the children’s interests, and begin to develop curricula from there. We are always asking questions about the meaning and values of the work we are doing with children, and responding to the children by planning, posing questions, and presenting the children with new materials and challenges. Children in the Multiage Pre-K program work with our year-round school garden. The class participates in larger weekly garden projects with the school Naturalist as well as spends time outdoors daily. Additionally, natural materials are woven into the children’s work and play in the classroom. The garden presents a wonderful opportunity for children to interact directly with the elements - soil, water, and sunshine - to understand how these forces help plants grow and provide the food we eat. Throughout the year, children cook with the seasonal produce they harvest from the garden, sampling new flavors and textures with teachers and classmates. During cooking projects, snack time, and lunch time children place food scraps into the school compost as the class learns what materials to divert from the landfill, and instead feed to the school worms! We also seek to bring families into our learning endeavors as much as possible. Teachers post regularly on a class blog, which parents may access at any time, to read about their children’s lives at school and post feedback and ideas. Parents are encouraged to join us at school to contribute to special projects. Click here to see a Sample Daily Schedule. Two- and three-year-olds crave independence and are curious to explore the world around them. Our Twos-Threes Class offers a gentle introduction to the group experience by providing a nurturing, responsive environment that supports each child. 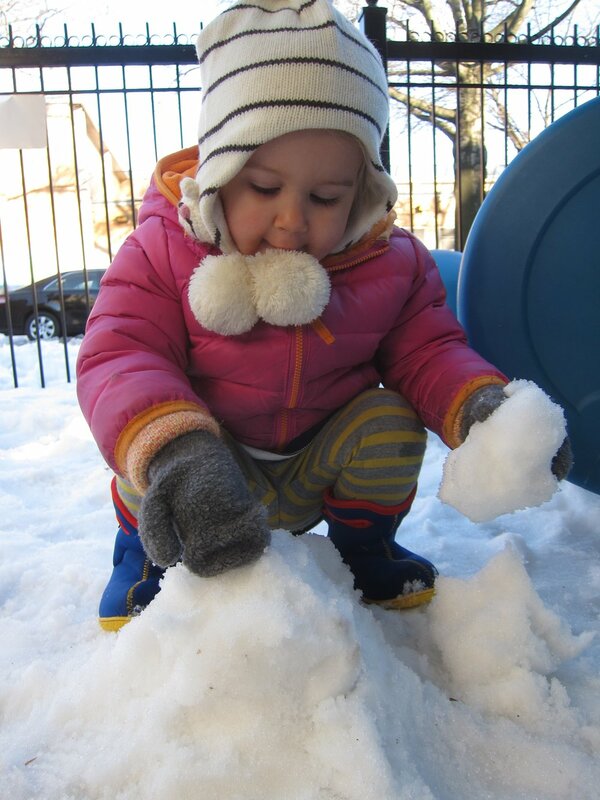 The classroom, materials, and explorations are tailored to each child’s interests and developmental stage. Teachers meet weekly to discuss their observations of the children and develop curricula from there. For the teachers, the beginning of the year is devoted to getting to know the children, and establishing our routines based on the children’s rhythms and needs. For the children, this time is spent learning about their new classroom, classmates and teachers, and of course, working on the big task of separating. Our separation philosophy focuses on a gradual, child-centered, individualistic approach to separating from a parent or caregiver and attaching to a teacher or even looking forward to seeing a friend. As the teachers get to know the themes and ideas the children are interested in, we facilitate experiences designed to harness their curiosity and expand the children’s thinking. In a day the children may build, paint, climb, dance, cook, sing, listen, and laugh. The class spends some of each school day outside in the yard exploring the natural elements, and regularly visiting and working in the year-round school garden. Children touch the soil, look for bugs, care for the plants, and harvest new foods to taste. Then, during snack and cooking projects the children learn what food scraps can be fed to the class worms as an introduction to composting. A supportive environment is at the heart of our class, and it is our goal to help children feel confident and enjoy their first school experience. It is important to us to bring families into our learning. Teachers post regularly on a class blog, which parents may access at any time, to read about their children’s lives at school and post feedback and ideas. Parents are encouraged to join us at school to contribute to special projects. Together Time creates an opportunity for families to connect while engaging with their children and becoming a part of our school community. Parents and caregivers will participate in weekly readings and discussions to develop a deeper understanding of topics ranging from setting boundaries with your toddler to the importance of play in development. During this weekly class children will work with open ended materials while exploring a new environment with their grownups and interacting with their peers. The goal of this program is to provide a warm and nurturing environment for children to engage in their first school experience, while creating space for families and caregivers to be active participants in their child’s lifelong learning process. Each class will take place in our calm and beautiful one room schoolhouse. Children will explore, play, and have a snack, and parents and caregivers will observe and engage in group discussions. Together Time is offered in three sessions - Fall, Winter, and Spring. Please see the dates of each session below. Classes will run Thursdays from 2:45 - 4:15. You may enroll in a single session for $580, two sessions for $1,130, and three sessions for $1,650. Click here to register for Together Time! For children who are three to five years old at the start of the program, starting October 2, 2018. Enrollment for the full school year is open to children who are 3-years-old by the start of the program. Enrollment for the spring session will be opened to children in our Twos-Threes Class pending available spots. Nature-based education promotes positive development of the whole child. Our grounding value is to instill in children wonderment in, and love of nature. Playing in the outdoors, planting seeds in a garden box, standing in a spring rain shower, and building with sticks are all a part of nature-based education. At Brooklyn Schoolhouse these experiences are an integral part of every child’s school day. Through the Nature School program children will have the opportunity to delve further into these experiences. We will explore natural materials outdoors in all weather while connecting with the natural world as we grow into our roles as environmental stewards. Our afternoons will begin with projects like growing different kinds of plants and seeds, making natural plant-based dyes, and caring for school pets. These projects will grow as the children share their interests and start to ask questions. Our nature exploration will extend into science experiments, cooking with the produce we grow, learning about important naturalists, and reflecting our experiences in nature through artistic media. In our work we will cover topics ranging from composting and recycling to basic botany to geology, all with the goal of inspiring a love of and connection to the natural world. As part of our curriculum we will also take trips to explore the natural environment beyond our school. In addition to teacher led nature walks in our community, we will also ask parents and caregivers to join us for five off-site field trips throughout the year. We plan to visit our local community garden, Battery Urban Farm, Prospect Park, and other natural spaces nearby. Nature School is offered as a year round program, and runs on the school calendar. The first day is October 1, 2019. . Classes run Tuesday and Thursday 2:00 - 3:30. Priority is given to families who enroll for the full program with classes on Tuesday and Thursday for $3,445. There are limited Tuesday or Thursday spots for $1,875. Click here to register for Nature School! We are looking forward to our 2019 Summer Program at Brooklyn Schoolhouse! The structure of the day is modeled after our Multiage Pre-K, and infused with fun summer elements. Inside, children will be invited to collaborate on projects related to the weekly theme, and also to work and play in the various areas of the classroom; painting, building, dramatic play, books, and everything else they imagine and create! 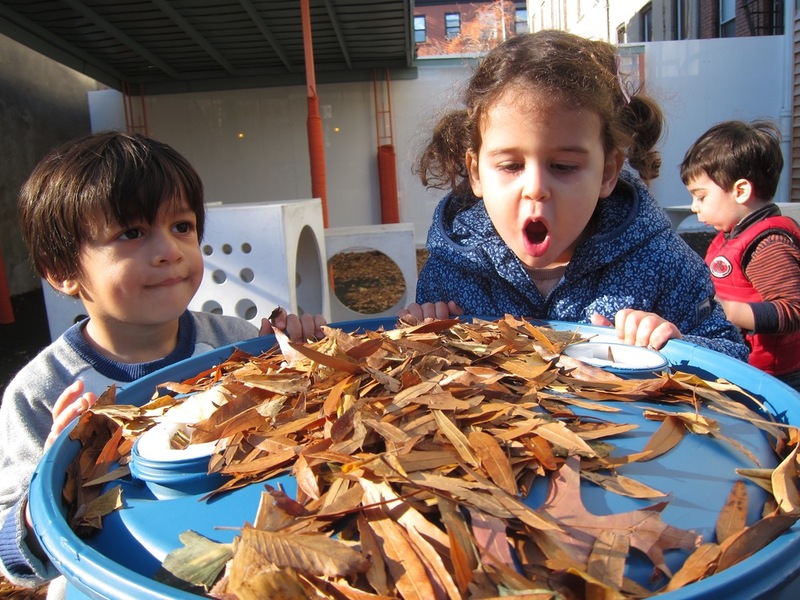 We will spend a large portion of our time outside in our yard with playful summer elements added to our open-ended building and play materials. Think: bubbles, an outdoor water table, bathing suits and running through sprinklers, and beach balls! Each day the children will engage in Choice Time in the classroom, Daily Meeting, Snack, Yard Time, Song Circle, Story, and our days will conclude with home packed lunch, all together. As always, parent involvement is welcome! *Register for any number of weeks June 10 - August 1. Find our weekly themes below. Registration is open through March 20th, 2019. - Making recipes from scratch such as pitas, tortillas, fruit kebabs, teas, and much more! - Experiencing different types of dance, such as yoga, ballet, modern, salsa, descriptive movement and more! - Running through sprinklers in the yard! 2016/17 workshops and dates to be announced. Free and open to the community. We are very pleased to welcome Colleen Goddard, Ph.D. to our team at Brooklyn Schoolhouse this year! With over twenty years of experience in early childhood education, Colleen is an invaluable source of insight, understanding, and support for parents and teachers regarding matters of parenting and child development. For more information about Colleen's background please take a look at her bio below. 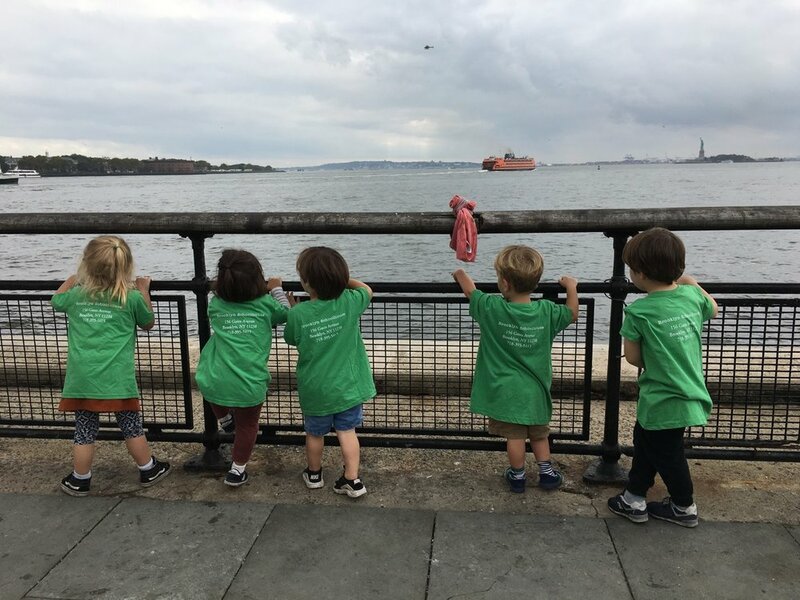 While Colleen hosts ongoing workshops with Brooklyn Schoolhouse, this school year we are pleased to offer parents the additional opportunity to work with Colleen directly. Parents are invited to arrange an observation and meeting with Colleen to discuss any questions or concerns they may have. We are thrilled to have Colleen as an integrated part of our team, and to be able to offer this wonderful opportunity to our families! Colleen Goddard, Ph.D. works as the Child Development Specialist at Beginnings Nursery School and Brooklyn Schoolhouse. She has over 22 years of experience in early childhood education. Colleen received an Excellence in teaching Award from the NYC Early Childhood Professional Development Institute in 2009. She also received a Parent's Choice Award for Excellence in Educational Programming for a film she wrote and performed in, which addresses the social-emotional and psychological aspects of childhood cancer. She has worked as a contributing writer for the New York State Early Learning Guidelines as park if the New York State Early Childhood Advisory Council and has been published by Psychology Today Online and ChangingMinds.Org. Colleen presents parent and teacher educational workshops and roundtables, at early childhood schools and centers, on a variety of topics related to human and child development. Colleen also works as an Assistant adjunct Professor at Hunter College, Brooklyn College, with the NYU School of Professional Studies CDA Program, and as a fieldwork supervisor for New York University graduate students in general and special education programs. She holds a Master's Degree in Human Development with a Specialization in Early Human & Organizational Development from Fielding Graduate University where she completed her Ph.D. in Human/Child Development - her dissertation examines the significance of transitional objects at the beginning and end of life.